Parasitic infections are among the oldest and most common infections in humans. Host defense alterations caused by autoimmune diseases or immunosuppressive drugs can cause modifications of the symptoms: indolent parasites can be reactivated, asymptomatic patients may experience new symptoms, or mild or moderate symptoms can become serious and, rarely, may lead to death. In recent years, new drugs have been used in the treatment of rheumatoid arthritis (RA), causing a greater level of immunosuppression and, therefore, more concerns regarding the risk of serious parasitic diseases. 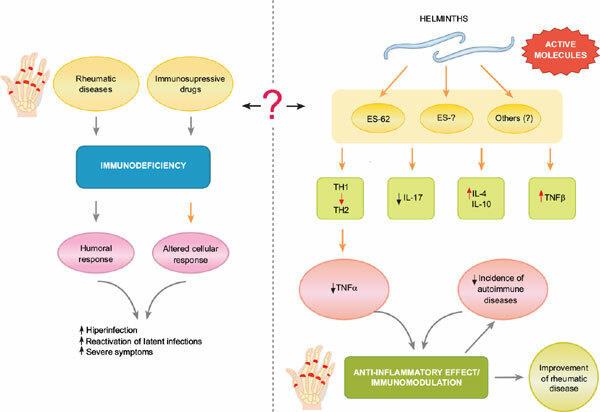 Of note, experimental studies have demonstrated that the immunomodulation induced by infection with helminths can minimize the occurrence and severity of rheumatoid arthritis. Products derived from helminths (such as glycoprotein ES-62) can exert favorable effects in RA patients via their anti-inflammatory actions. Greater knowledge of these substances may serve as a basis for the development of new treatments for RA. The full impact of parasitic diseases on patients with rheumatoid arthritis remains controversial, and further studies are warrented. Keywords: Helminths, parasitic infections, rheumatoid arthritis, immunomodulation, glycoprotein, autoimmune. Title:Parasites in Rheumatoid Arthritis: Imminent Threat or Protective Effect? Keywords:Helminths, parasitic infections, rheumatoid arthritis, immunomodulation, glycoprotein, autoimmune. Abstract:Parasitic infections are among the oldest and most common infections in humans. Host defense alterations caused by autoimmune diseases or immunosuppressive drugs can cause modifications of the symptoms: indolent parasites can be reactivated, asymptomatic patients may experience new symptoms, or mild or moderate symptoms can become serious and, rarely, may lead to death. In recent years, new drugs have been used in the treatment of rheumatoid arthritis (RA), causing a greater level of immunosuppression and, therefore, more concerns regarding the risk of serious parasitic diseases. Of note, experimental studies have demonstrated that the immunomodulation induced by infection with helminths can minimize the occurrence and severity of rheumatoid arthritis. Products derived from helminths (such as glycoprotein ES-62) can exert favorable effects in RA patients via their anti-inflammatory actions. Greater knowledge of these substances may serve as a basis for the development of new treatments for RA. The full impact of parasitic diseases on patients with rheumatoid arthritis remains controversial, and further studies are warrented.